The region is perfect for cyclists with many stages of the Giro d'Italia close by. There are around 15 Golf clubs within 30kms. Jacques and Anna will take you to Cadora Winery to tour the vineyards and taste the produce. Our guests enjoy a unique experience: staying in a 500 year old home which always belonged to our family, strong traditions, love for culture and art. We speak 5 languages and can entertain our guests; we can take them to wineries and have the most amazing wine tasting; we can offer cooking classes in our kitchen showing them how to make tagliatelle from scratch: hand made and hand cut. 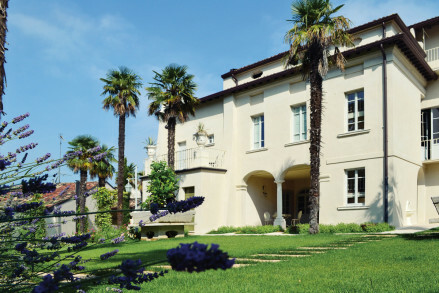 At Villa San Pietro you'll find a unique experience in a family home. You come, you stay and you leave as a friend, as a guest, never as a client! You can visit the Lake District within 30 min (Lake Garda-Lake Iseo-Lake Idro). Mantua, Verona, Cremona within 40 minutes, Milan in one hour and Venice in one and a half. It's an ideal location for exploring northern Italy and enjoying a tranquil, ancient villa with original features such as oak beams, terracotta tiles, and frescoes from the 17th century. We offer a full breakfast with homemade bread, jams, cakes, muffins and biscuits. We also offer ham and cheese, orange juice, yogurt, fruit , tea, coffee...anything you wish - upon request. We can cook for our guests and we can eat all together. We can also recommend any type of restaurants and osterias in the area. Our rooms are very spacious: 25 square metres, with a/c, heating, tea and coffee making facilities, water. There are books for our guests to enjoy, a marble terraced loggia, a beautiful garden with pond, private parking, free wifi everywhere. The favourite rooms are the Salmon and Pink Suites. All our furniture is antique and has passed down through the family! We welcome children of all ages and we have eevrything for them. All rooms are triples and we can add a fourth bed for kids.